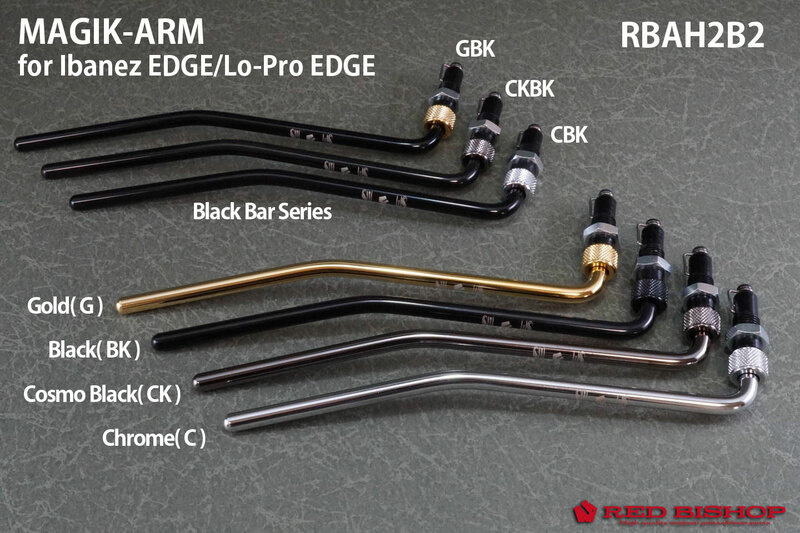 " MAGIK-ARM for Ibanez EDGE/Lo-Pro EDGE (RBAH2B2) " is the new version of RED BISHOP MAGIK-ARM. After releasing MAGIK-ARM for Floyd Rose, many high-end customers gave us much praise for the quality. And we decided to extend MAGIK-ARM product line because there are many opinions of wantig new MAGIK-ARM for Ibanez EDGE/Lo-Pro EDGE tremolos. Edge/Lo-Pro EDGE tremolo bridges can allow guitar players to do wide range arm-down and arm-up actions. But there is one problem for comfortable play. It is the " play " of tremolo arm. There has been a headache of wobbly trem arm. Please grab your guitar's tremolo arm and do arm-down and arm-up slowly. Maybe almost There is "wobbly play " . In the meaning of direct feeling, most of professional guitarists and high-class amateur musicians don't feel this " play " comfortable. On the other hand, there was not good solution in fact. RED BISHOP invited Mr.Shinjiro Hirayama as chief designer who worked for Ibanez for many years and developed many guitars and hardwares. And after many intensive testing, now we succeeded to produce the new solution, MAGIK-ARM.
" MAGIK-ARM " solve this problem by unique new constructure and high machining accuracy, and one by one handmade process.And further, we succeeded to make MAGIK-ARM even if it is in arm-free condition, the arm bar doesn't have big "play" as before. It's just " MAGIK-ARM ". You don't have to change plastic washers of the EDGE bar any more, and you can change the arm torque whenever you like !! Enjoy the upper level quality ! Unique design and high machining accuracy allows to minimize the "play" of tremolo arm.Smooth turning in torqueful condition. Even if it is arm-free condition, the "play" of tremolo arm is almost none. 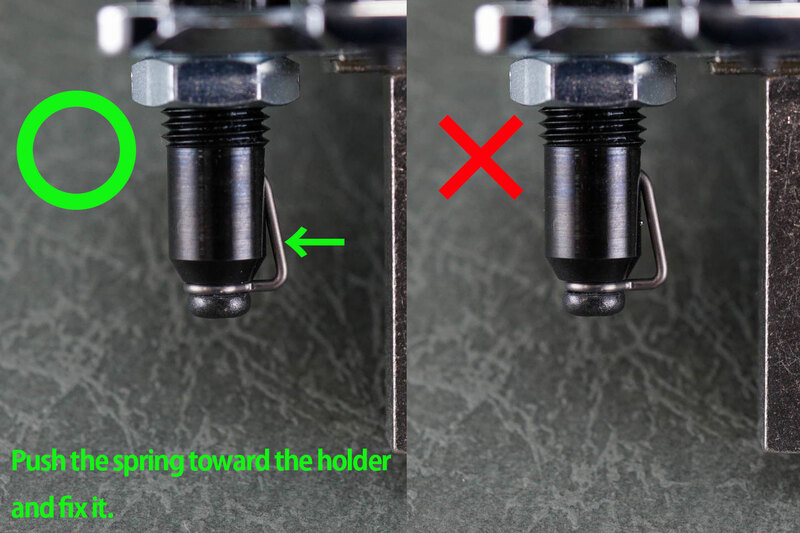 You can adjust torque with torque-cap screw, so you don't need to change plastic washers of the EDGE bar. Snap-in structure gives you easy arm removing. 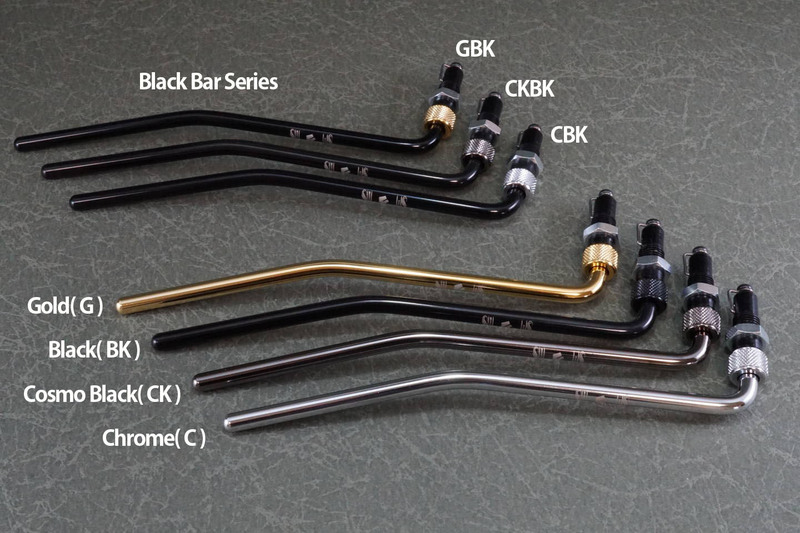 Teflon coating is treated on snap-in spring, so the bar rotation is smooth. High grade appearance by Japanese machining and plating. 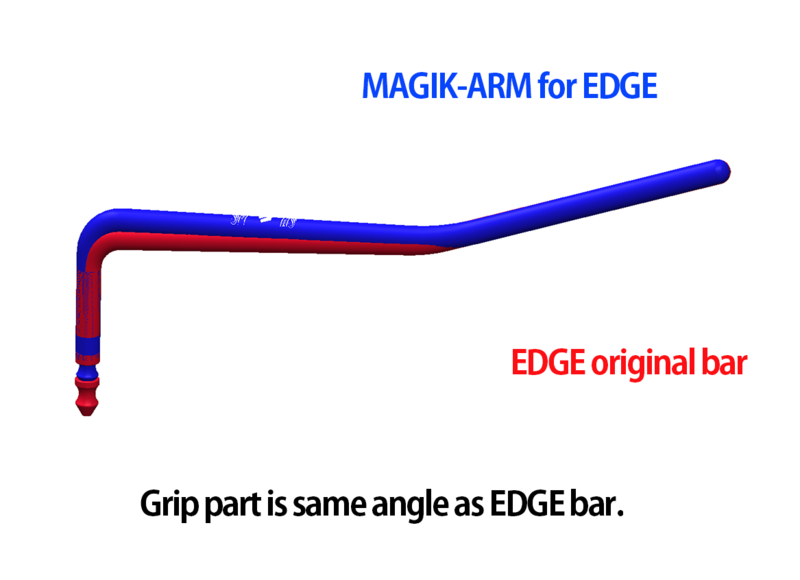 The bar 's grip height and angle are the same as EDGE, so you can easily switch for using MAGIK-ARM. 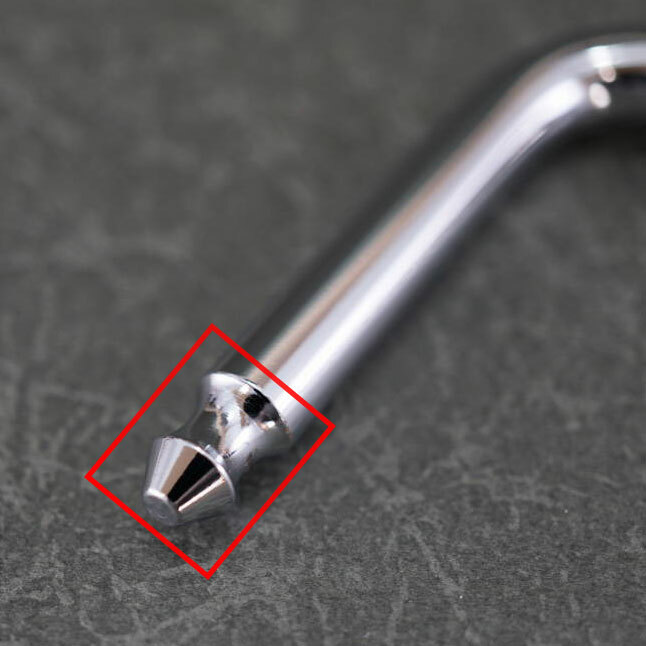 The bar bending part is higher than EDGE's, so you can rotate the bar without interference with the fine tuning screws. Unremovable treatment on torque-cap screw, you don't need to worry losting. You can choose your favorite color from 7 colors. Shipped after checking one by one. ・Remove original snap spring and fixation screw from original arm holder. Remove the nut by using 10mm wrench. ・Remove original arm holder by using Arm Holder Driver. ・Install the MAGIK-ARM arm holder. Get apart the temporarily assembled parts. ・Once tighten the arm holder into bridge baseplate until the end. If it is too stiff to turn, use pliers after wrapping the arm holder with a soft one. Fix the snap-in spring. At this time, pushing snap-in spring toward arm holder like picture is important for good result. 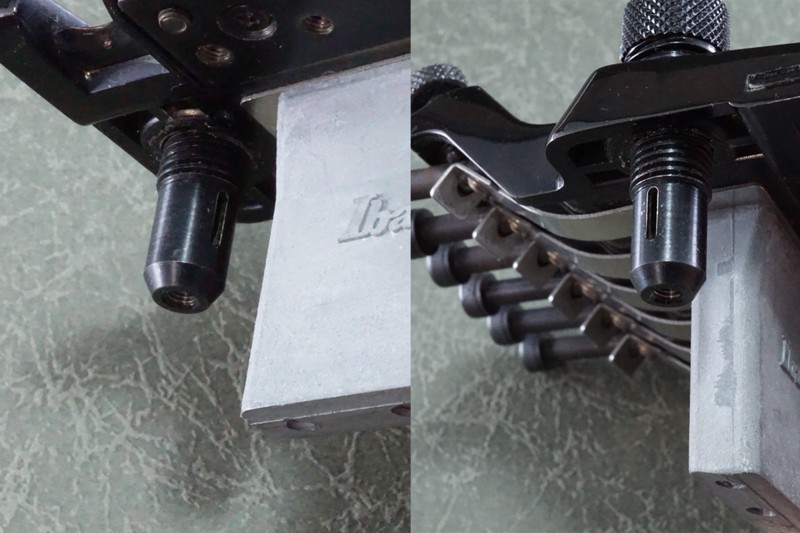 After loosening torque-cap screw, push the arm bar into arm holder until it clicks. After loosening torque-cap screw with half rotation, and pull the arm bar. Tighten the torque-cap screw strongly. Tighten the torque-cap screw softly. For smooth arm bar rotation, we recommend to put CRC oil on the part of picture below at regular intervals. The MAGIK-ARM is the ultimate update for every Floyd Rose style Tremolo. It really works perfect and the annoying arm Play is past.In future builds I am going to equip every Floyd Rose Tremolo with the fantastic MAGIK-ARM! I installed my MAGIK-ARM today and LOVE It!!! Thank you so much! It's awesome. Keep up the great work, I'm telling everyone I know that they need to buy one. Cheers! I've been using Original Floyd Rose made in West Germany for more than 30 years. Present Floyd Rose arm holder is better than the original screw type one, but there is still small "play" , so I used it with some patience. I make vibato by tremolo arm, so I used Floyd Rose tremolo arm with hard torque condition, still not enough though. I changed the torque depending on songs but little time between songs on stage because I have to tune pitch and do other things. So I had felt some stress. I found MAGIK-ARM by chance and tried, there is no "play", easy installing, easy torque adjustment, easy arm removing. It's very helpful! I bought Gold one and the appearance is excellent. I'll buy Black one next! I had a problem with the "play" of my Floyd Rose tremolo arm. I tried some products but they didn't satisfy me. When I purchased MAGIK-ARM, I doubted a little but after using it, I'm very impressed by the less "play" and the smoothness. Now I can concentrate on my guitar play. Maybe I'll put MAGIK-ARM on my other all guitars.